Have you heard them as well? Unhelpful remarks about collecting by the catalogue? 'Merely ticking boxes. How can you? Be a bit more original. How boring. Anyone can do that.' 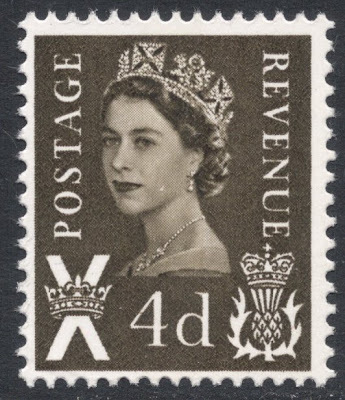 Well, as a stamp collector, and even more as an all-world collector, one does tend to take a bit of flak, that is to be expected. But always remember it comes from those who do not see all the fun and the possibilities of collecting, and there's never anything wrong with what you want to collect. So when I'm working on my 32-page Scottish Wilding display, which will hopefully go up at the next ASPS Congress, in 2013, I get out my catalogue and start ticking boxes. I start off, of course, with the singles, all nice and mint (wallpaper anyone? ), all specialised, all there. Tick, tick, tick. Feelin' good! Then my catalogue moves on to the cylinder blocks. 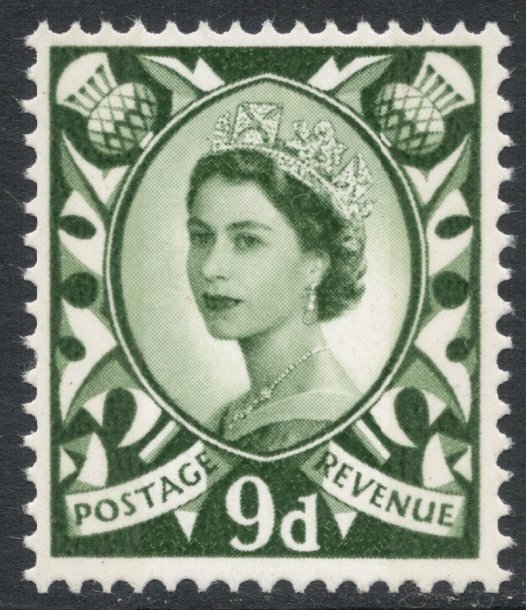 The more often used values in double pane printings, the higher values in single pane printings. 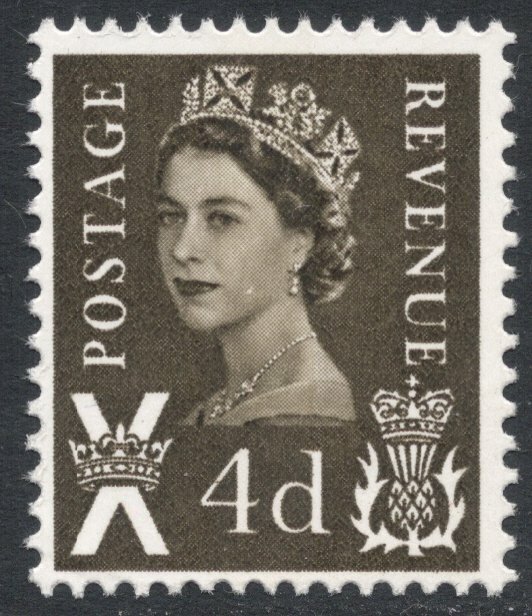 The double pane printings consist of dot and no dot panes, referring to (the absence of) a dot behind the cylinder number, to denote the left and right panes. Single pane printings are all no dot. I even have my catalogue telling me about major varieties, and in which position I can find them in the sheet. Great for collecting them in positional blocks! ...to be found on row 15, position 2, with the W-shaped marking placed between rows 10 and 11. My catalogue even goes on to list the minor varieties, again with positions mentioned, though I've chosen to just get those as singles, so as not to take up too much space. But still, I'm working down the lists and am ticking boxes. Great! Does it stop there? Oh my goodness no! You see, my catalogue moves on to sheet markings. 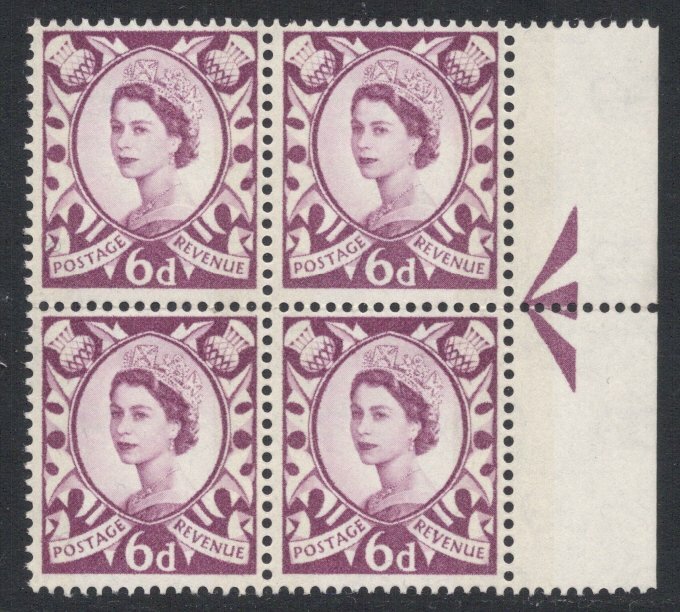 Those V and W shaped markings in the centre of the sheet margins, to aid post office staff, they get a mention and therefore a place in my collection. You see, they also aid stamp collectors, as was noticed on the above positional block. The marginal rules, too, get a mention. All similar, apart from the ones on cylinder 1 of the 6d stamp. 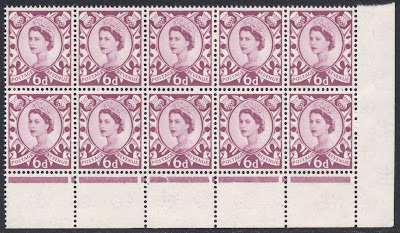 These are not as wide and are interspersed with tiny ones where the perforations go. And besides, the ones below columns 9/12 are damaged. You see, you need a catalogue for that! And talking about perforations: yes, they're all roughly 15x14 but different perforators were used and these again are all mentioned in the catalogue and so I'm able to build up a collection of those as well. 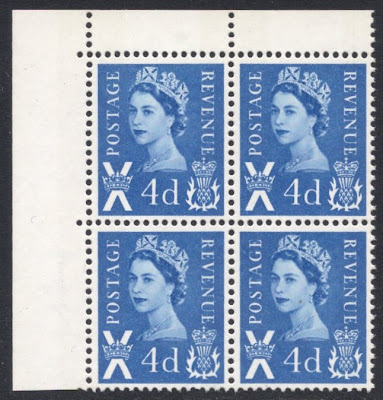 Perforation Type A: top margin perforated through, left margin a single extension hole. What do we have here? A block from rows 10 and 11 and columns 11 and 12. 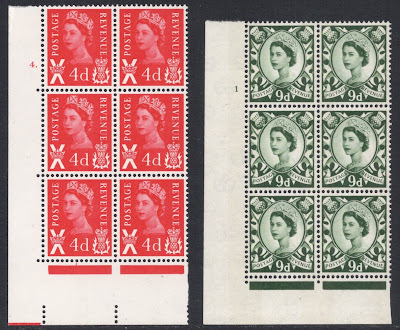 (A full sheet has 240 stamps in 20 rows of 12 stamps. Remember that the W-shape is in the centre of the margins? 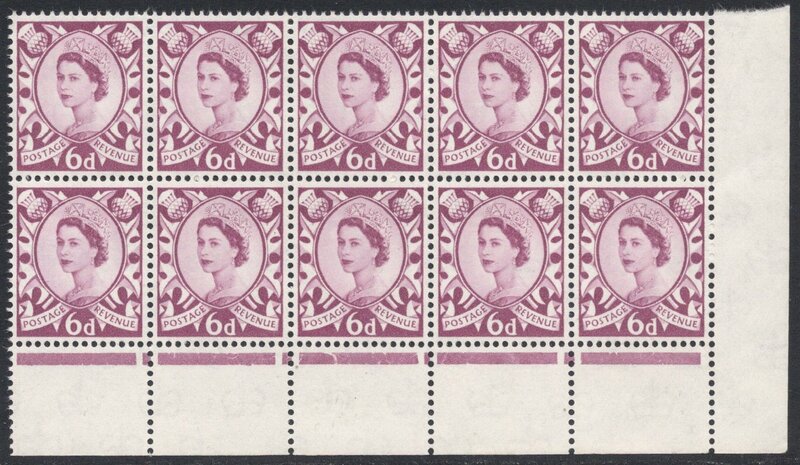 Exactly: between rows 10 and 11) A quick glance at the catalogue confirms that this block (why else would I have it?!) includes the retouched variety of the broken V in Revenue. On position R11/12, which you will be able to point out without any problems. Here's a close-up of the still fuzzy retouched V.
But there's one more problem to solve: the retouched variety can be found on both cylinders 2 and 4! Ah, but by now you know your perforator varieties! The two cylinders can only be found in combination with perforation types B and C and F(L), and of those only type F(L) has a right margin which is perforated through. Perforation type F(L) was only used for cylinder 4, so there you have it. Sherlock Holmes eat your heart out! Don't collect by the catalogue? I'd say DO collect by the catalogue and you'll be able to build up the most wonderful collection! excellent piece Adrian. well done. I think I'll leave the security issues to the experts! But feel free to comment on them in our Machin forum thread on the website!